This post is not to be taken too seriously it´s just a humorous comparison of the typical Saudi man and his Finnish counterpart as husbands.. The Saudi man is very romantic, sweet talk is what he knows. The Finnish man doesn´t talk or kiss as the saying goes. When the light bulbs need changing the Saudi man calls the Pakistani electrician to the rescue. The Finnish man thinks, I might as well change them all to new. while the Finnish man is stuck with the wife and her constant rambling. 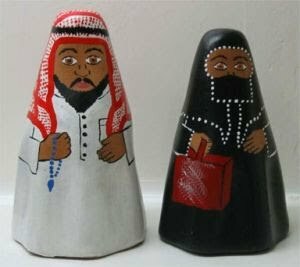 When the Saudi man comes home he expects a hot meal. The Finnish man only can only dream of such a great deal. When the wife is not home the Saudi man orders home delivered shwarma because he doesn´t know how to cook. The Finnish man creates a nice dinner by looking in the cooking book. If the Saudi´s favorite football team looses he heads for the sheesha place to unwind. The Finnish man is already in the bar watching ice hockey and getting drunk out of his mind. If the team wins the Saudi man calls his friends to celebrate. The Finnish man will stay in the bar until very late. When the car needs the oils changed the Saudi man sends the driver to get it fixed. The Finnish man asks his wife to do it and not to forget the beer and chips. When their child is born the Saudi man goes to the souq to get his wife gold and diamonds. The Finnish man heads to the bar to get drunk with his friends. while his Finnish counterpart wears the same socks for a week then throws them on the floor for the wife to pick up and murmur. while the Finnish man sits watching ice hockey and asks for a beer or three. while the Finnish man pours some vodka down the drain to flush out the clog. The Finnish husband thinks it´s enough he took out the garbage. That is great! I think I will do a similar comparison for the Kurdish husband vs. American husband.... this could be fun! Lovely, missed the contrasting humorous posts of yours, congrats on the baby! Hi there Mohamed and thanks for your comment! Haha that is quiet humorous. Thank you for sharing it ! And thank you for taking the time to take a look at my blog. hi fatma thank you and welcome to my blog!! Alia- I love your blog! Hahaha...This is one entertaining post Laylah.My husband is an Iraqi but i'm not sure what kind of Iraqi traits that he's carrying.Perhaps I should do one Iraqi husbands vs Malaysian men..LOL. By the way, I'm Malaysian married to an Iraqi and lives in Malaysia. cute; but it's telling that so much of the difference is not due to culture but to economics. notice how many times the Indian/Pakistani or the worker is mentioned when it comes to the Saudi husband 'doing' something. He doesn't really do it himself, does he? Hi Stephanie! thanks for the comment looking forward to reading it!